Here is a musical introduction to this week's blog, setting the agenda. When I told my Darling Dublin Friend that my house was being attacked by fleas, she sent me this. I realised then that it was all up to me, there were only muffled giggles from Dublin and no offers to come over and help pelt the little buggers. Today I will talk about my flea infestation, and the manner in which you get what you ask for, but not in the straight forward manner that would make sense in a busy world. I will also give you a brief idea of what I am doing at the moment. 15 year old son woke recently and said, Look. Look at my itchy bites. I thought, Ah. I will ignore this and it will go away. So I sent him on his way with a cheery wave, until, I awoke with itchy bites a few days later. I have itchy bites, I yelled, it's all about me! Poor son showed me his new bites and we began to fear we had bed bugs. Son and I stripped our beds to the bone and saw no bed bugs at all, no signs of them and no evidence whatsoever. They are hiding, I said to son, let us do this later in the dark and show them who is boss. We waited till dark, and pounced, still in the dark, with a torch, to catch the bed bugs that I imagined lolling around on our beds, complaining that there was nothing to eat, and who had made such a mess of the mattress and bed frame? But nothing. Not even the tail end of a bed bug scurrying for cover into the springs. Well, our relief was short lived as we both awoke the next morning and compared our new bites. I called our local council, and asked for help. Send me your best exterminators, I said, I have bed bugs but they are a new breed of clever and invisible bed bug, and we need the Arnold Schwarzenegger approach. Madam, said the kind lady on the phone, you may find that you have fleas. Mother, said my excellent daughter on the phone later that night, you have fleas. Two pest control men came. Ah! they said as I showed them the beds, there are no bed bugs, you are clean of bed bugs. The reason you cannot catch them, even with a torch, even late at night in the dark, is because you, praise the Lord, have none. I had looked online at the methods of getting rid of bed bugs, and it seems that I would have to pay a lot, burn the house, all its contents, and move abroad to get rid of them. What a relief. Have you a cat? Asked my new best friends from Arun Pest Control. I don't, but my polite and elegant lodger does. Reggie, the sleek black man cat, lives with my very wonderful lodger in the annex which I rent out. Reggie, sure enough, was sitting proudly amongst his fleas. There is your answer, said my pals from pest control. The cat needs to be deflea-ed and so does your house. Come tomorrow, I cried, and save us. Righto, they said, 11am. But, they said, you must now hoover every inch of your floors, especially the edges of the rooms, you must get rid of dust and mess, clean under all the beds, the furniture, throw out clutter. When you have done that, remove every item that you can from off the floor so that we can come in tomorrow and give those fleas a chemical Armageddon. Here is where the manner in which you get what you ask for becomes an interesting discussion point. At this point, the nature of the universe collides with the most basic of things, the removal of fleas. As I wearily returned to the house after moving him, I remember thinking that the house is in need of such a clean and a declutter that I may just have to die. I have no time, no energy, to do it and what is more, I hate the idea with a passion. It isn't, I thought as I checked my empty fridge for my latest weight watcher dinner of air and vegetables, fair. I am the only person in the world to have such a terrible life. I saw myself as wading through eddies of dust and debris in my house, the sound of wind coming through the broken windows making the plastic bags caught on the doors and old bits of furniture, rustle and flap forlornly. I saw myself too thin (weight watchers) to take the apron from behind the door and start to tackle this mess. And so God gave me fleas. Jump to it, he said both to them and to me. If I give you fleas, you will have to scurry around clearing up your house between the hours of 3pm when you get the diagnosis from Arun Pest Control, till 11am the next morning when they will arrive like Ghost Busters, with all their paraphernalia with which to bash seven bells out the fleas. Chop chop, he said. Spit spot, as Mary Poppins has said. Spit spot. I have a five bedroom house with an annex. It is a big job. I rolled up my sleeves, furrowed my brow, did a war dance like the Haka, and with a yell, I began. I hoovered the floors, walls, ceilings, and furniture. I threw away, I banished, I flung from the house; the flea larvae loves the dust, the flea expert had said, eliminate all dust. Dust, I said as I battled through, Dust, you are toast. At 11am the next morning, a single man arrived with a small pump and some chemicals (not 10 men with a lorry with a radar on the roof as I had expected) and within a couple of hours, my house was a battle field in which the fleas had been routed. I cannot hoover or clean the floors for 3 weeks, as there is a layer of flea napalm on it. But the house, the furniture, everything as far as the eye can see, is clean! It is over! I live in a show house (ish), I have fresh flowers in every room and Doris Day can come and live here now, I have gone from the ridiculous to the sublime. I have what I wanted, and all because of Reggie. Thanks Reggie. But don't do it again. What am I doing these days? Here is a list. I sold my Teapot Fairy to my dear friend and Soul Midwife Mandy, and am putting some wings and a halo on it so that it is a Teapot Angel. I distance reiki'd Felicity Warner (www.soulmidwives.co.uk) and she said she felt better. She is a kind lady. I am planning my route up to the Chimp House in Edinburgh Zoo where I am taking A Graceful Death to take part in the Good Life, Good Death, Good Grief annual event. This is becoming a wonderful outing as I am staying at different friends along the way and way back. There are wonderful conference facilities in the Chimp House in the Zoo. Got you there. I am all over the shop getting ideas and meeting people. Now that I don't have fleas, I have an extra dimension to me, and believe that the world is all mine. I have to do a power point presentation on Spirituality and Well Being In End Of Life Care, for the Spirituality Conference next month for LOROS (Leicestershire and Rutland Organisation for the Relief of Suffering). I am full of strange ideas that need some careful sorting. More on that as it evolves. So now, to end, I will show you how the fleas felt when I was doing my Haka type war dance. Watch this and tremble. This blog is a day late, I hope you have not suffered. However, we are here now, writing and reading, so perhaps we can let this slide into what some may call the Great Cosmic Circle of Life. And now, from this same Great Cosmic Circle of Life comes today's blog. Read on, it is topical, and universal. I deal, today, with faffing. There are two strands of thought in my head at the moment, 1. Perception 2. Reality. A day contains only 24 hours. There is a day time and a night time with sleeps for up to 8 hours included, and mealtimes thrown in to cheer us up. After having done the chatting to the family bit, after having done the daily bits and pieces of getting dressed and up and running, there is not an endless stretch of time to work, do your thing, make a difference, change the world. This part of the 24 hours, the bit where I don't have to do any more household stuff, is the bit where either I faff, or I get things done. Each day the amount of time is about the same for me to either gird my loins and smite the smiteable, or to clasp my hands together and wring them. So as a Faffer, the perception of time is that it isn't enough, however long one has. When I am Faffing I cannot remember what it is that I have to do, I couldn't make a list to save my life. It seems as if there is an enormous world outside, beyond my studio, full of people who have noticed the things that I have not done and full of furious people in companies, organisations, groups, who are slamming down onto their very organised and perfectly planned desks, the latest memo that has come to their attention of all the things that could have been just perfect if only Antonia Rolls had stopped filing her nails and putting the washing on, and done all those nebulous things that she had promised to do. Here we are, one glowering successful person is saying across a sunlit open planned office in a gloriously up beat part of town, to another. Here we are, saving the world, making a difference, doing what comes naturally to people like us, being efficient - but now! There is faffing going on in Bognor Regis, and it is holding us up. We cannot have this! Off with her head! At times like these, when I can't quite get my thinking straight, it is as if the things that I long to do and that I have promised to do, drift away past me, like the old Bisto gravy advert, where the two children sniff longingly and delightedly as the smell of Bisto tantilisingly passes under their noses and out through the open window into the middle distance. I am sure that I have signed up for more than I can deliver, I am sure that I don't have the power to deliver all those dreams that once seemed so important. It is not helpful, though inevitable, to be over critical when watching ones life and ambition drift like the Bisto advert, out of the open window and off into the neighbour's garden. Ah me! I say as not only my dreams and ambitions disappear slowly into my neighbour's garden, ah me! Time itself has been upended and what was once simply just a day for filling with pithy and delightful things to make the world a better place, has become a barren and ever decreasing speck of nothing on the space time continuum. Time, that thing which was once mine to command, is but a gravy advert, wafting away from under my nose out and into Bognor Regis, along with all of my common sense . At this point, 15 year old son comes home from school and I am relieved because one thing I can do at all times, is cook sausages. Very astute folk say that we can't know what we do want unless we have experienced what we don't want. Well, I don't want to faff. I know I don't want to faff because I have done so, and it gets me nowhere. Here is the reality and the part where I metaphorically gird my loins and get on out there. So to speak. Time! I say, with passion. I bite my thumb at you! What is this nonsense that there is not enough of you? There is always the same amount of you, and sometimes you get full up. Sometimes you don't. It is my perception of you, when in a droopy state of mind, that is making me feel so low. So now, when I am aware that time is not my enemy, faffing is a thing of the mind, and that I am not, somehow, homeless and without a future, I can get on with stuff. Once I am clear of mind again, once I have come out from the Tunnel of Faff, I wonder what on earth it was all about. Those people slapping down memos saying, Good Lord, she was but a whisp of promise in the air, that is all, sever all connections! are now saying, What vim! What verve! Let us work with her because she is all that she said she was and whatever that is, we need it to save the planet. Send her an email saying Yes! So this is my reality. I get stuck, and then I get unstuck. When I am stuck, when I am miserable, I can't paint. I can't think, and I can't do anything. When that passes, which it always does, I am very relieved and set about writing my lists with gay abandon. I can do it all! You want A Graceful Death in Smolensk? Yes! You want a workshop on Soul Midwives in the Offshore Oil Industry? Yes! You want a spot of Reiki even though you live in Timbuktu? Of course! You want a portrait of your entire extended family in fancy dress plus all retainers? Yes! Actually, none of these things happen, I have not been offered anything like this but if I was, I would say Yes! And so, life goes on. Back to the Great Cosmic Circle of Life which we mentioned at the beginning of this blog. Written in fire at the top of the Great Cosmic Circle of Life are the immortal words Faff Not, Thou Of Little Faith and below, still in words of fire, Gird Thee Thy Loins, Time To Write A List. And in between, descriptions of many stages along the way. And in the middle, written in a hand older than time itself, the words, Remember Thou, Bisto. All Singing, All Dancing Soul Midwives. And Gerald. Morning. Here is your menu for this week's news. The Soul Midwife meeting, the second of its kind and we hope the start of many more to come, happened here this week. We Soul Midwives are passionate about our work, and are longing to work with those facing the end of life. We know we can do it, we all feel the need to change the perception of death by making it part of life (which it is), talking about it, acknowledging it and helping to prepare for it. We have found though, that all of us work in different ways for the same end. For a while I was confused, feeling that I couldn't possibly do the work that the other Soul Midwives did, and I felt that what I had to offer was not good enough. I didn't know enough, I wasn't trained enough, I hadn't enough experience. And the subject is so big. How can we do anything to help anyone? How can I, a teeny tiny speck of dust, make any difference ever in a world a) full of people who know what they are doing b) full of people who don't know what they are doing c) full of people who long to know what they are doing and d) full of people who think I am barking. To do any kind of Soul Midwife work, you have to sit alongside people who face the end of their lives. We work alongside members of other professions - doctors, counsellors, therapists for example. You have to be able to stay with them, to listen, to help if they ask it, and to do whatever it takes to make their last times here, alive, good, meaningful, bearable, acknowledged. This is a time to stop faffing, and to say what needs to be said. Do what needs to be done, listen to things that need to be listened to and at all times go with whoever is dying, as far as they want you to go, in order that their death is as best as it is possible for it to be. That is all you need to start. And a Soul Midwife is not just someone who sits with another as they are dying, a Soul Midwife can help at any time, for as brief or as long as it takes, along the journey from diagnosis to death. As long as we are there when called, we do what is necessary and what we can for that person who needs us, we are Soul Midwives. I remember once having only a text conversation with a dying lady, and that one text conversation was all that she needed. So that was the extent of my Soul Midwifing for her, it was all that she wanted. There are Soul Midwives who are deeply experienced and are in the medical profession. There are Soul Midwives who run funeral businesses, who manage care homes, who offer complimentary therapies for end of life conditions, who do more spiritual and alternative treatments like Shamanism, and Angel Reiki. There are Soul Midwives who are looking for a path to follow, and have not found it yet, but are drawn to the work. There are Soul Midwives who volunteer at hospices, at care homes, Soul Midwives who are looking after family members, friends, friends of friends as they die, and there are Soul Midwives who teach and who help other people start their journey helping the dying to die. There are Soul Midwives who comfort someone sitting next to them at a bus stop, and move on because that encounter was all that was asked of them. I had a Soul Midwife encounter once with a man with months to live as we sat at Specsavers, waiting to be called for eye tests. It was all that was required, and he moved on. And Me! And there is me who paints people at the end of their lives and takes the A Graceful Death exhibition around the country, and talks about whatever I am asked to talk about. To whoever will listen. As a Soul Midwife, I work with the dying by being gentle, loving, present, and by trying to listen. I do whatever I can that works, I do arty things, and fun things, and mostly I just watch and let them take the lead - but I have no training, no qualifications, no idea. I can't tell a kidney from an eyeball, I can't do alternative medicine, I can't chant and do singing bowls and I don't know how to get someone off the bed and into a coffin. So, returning to feeling that I wasn't as capable as other Soul Midwives, I felt myself overwhelmed by what I couldn't do, instead of concentrating on what I could do. I struggled. It was not that I was hungry, I wasn't, it was just that I had to weigh my food and not snack on egg mayonnaise while I cooked cheesy oven chips. I struggled, and I persevered. Today, at weigh in, I had lost a pound and a half. This is truly wonderful, but I wondered if it took a week to put on a pound and a half. I doubt it. It would take an afternoon to put on a pound and a half, and this struck me as unfair. However, that is the way it is, and if I am at present, a barrel of lard, then it is going to be sulks all the way back to being my normal size. I was terribly busy today, and promised myself a binge on something or other as a reward for being so thin now but it never happened. All I could do is eat 3 weetabix with a half a tin of fruit in fruit juice, and I still have one point to go. Good Lord, am I brainwashed, or saved? I did not want a lump of cheese. I did not care about toast. I had three weetabix when two are the norm, and pigged out on an extra godforsaken weetabix. It is a scarey world. I have signed up as a volunteer for Age UK. They offer a scheme called Friendly Neighbours, which is what I am now doing. We visit the elderly who are socially isolated, and just chat with a cup of tea (no biscuits goddamn it, no weetabix either). The scheme lasts for 12 visits, and then the person being visited is reassessed to receive a more intense package of visits and help around the home etc. Today, I went to visit my first lady, and I had a ball. She talked about her life, and we drank tea, and she gave me invaluable advice on how to keep my partner, Alan, sweet. Give him a hug! she said, and when he comes in, make sure you look your best. And when he is not expecting it, give him a kiss! Men love to be kissed, she said. I bet they do, I thought. Alan would be pleased I think, to be kissed, but if he was watching American Football, he probably would not notice if I came in with a tea trolly on my head. So, I will go back to my lady next week. As we parted, she said Darling. Those earrings, they are not you. I don't like them. So I took them off and she said Ahh! Now, you are an executive, that looks so much better. Well, I like this lady and I never liked the earrings anyway. And I like looking executive. At least she didn't say Darling. You look fat. Ever thought of weetabix as an an alternative to all known foods? I have begun this Doula course in Lewes today, run by Hermoine Elliot of the Living Well Dying Well Foundation www.livingwelldyingwell.net. I was delighted to see that my friend the Soul Midwife Felicity Warner's book was there on sale, and I settled in to see what Hermoine's course offered me. It offered me a lot. I like Hermoine, I have met her before when I first tried to interest the world in the A Graceful Death exhibition and I have always wanted to go on one of her training courses. And here I am! On the first one and very excited about it too. Because I am back at home late at night now, having driven at 7.30 this morning to Lewes and arrived back here in Bognor at 8pm, and I am on Weight Blinking Watchers, and pooped beyond reason, I can't tell you the first thing about it except that I agree with everything and I think I am going to be a Soul Doula. Hermoine is thorough, and practical, and made me think a lot about my own reasons for doing this work. As I say, being exhausted tonight, I am blowed if I can remember what my reasons are, but it is OK, I think they are sane. It may be a good idea to write about this excellent course next week when I will be another pound and a half lighter and better able to communicate. No, it isn't linked. Yes, I will go to bed in a minute. I arrived home and despite being so weary, made a large vegetable stew, gallons of it for tonight with enough for my packed lunch in Lewes tomorrow, and have eaten it all while doing this blog. I went to the National Portrait Gallery last week with my Mother, 82, to see the photos of the Queen throughout the last 6 decades. Mother is a little hard of hearing and called out to me, over the heads of many tourists and visitors, from one end of the gallery, where she stood in front of a very fetching larger than life sized formal portrait of the Queen, to me looking at a selection of photos on a wall on the other side, Oh I do like the Queen because when she sits down she doesn't fiddle with herself. Frozen silence for a second, then muffled coughing fits as people tried to pretend they didn't hear Mother and tried to stifle their giggles in their hankies. Mother has no idea why so many red faced giggling people were in that room looking at the Queen in the nineteen ninetys. She just thought they were odd. Son, 15, has been traumatised by the breakdown of his laptop. It is in the menders, and so to help him cope, I have bought him what he wanted, a hamster called Gerald. Son, 15, loves Gerald, who is a wee dwarf hamster with red eyes. Gerald lives in an extraordinary creation that Son has made for him, with branches from shrubs in the garden, with chaotic climbing frames made from old video boxes, with buried piles of food in the sawdust, all inside a huge old hamster cage that used to house at least 2 large, not dwarf, hamsters. Gerald and Son have a bond. Gerald tries to run away from Son and Son tries to build him ever more complicated play areas. The cage looked a bit like a jungle last week, but I think that Son came to realise that dwarf hamsters are not like lions, and don't need undergrowth and trees to sleep under. Gerald is terribly happy, and so far loves his new life as a Facebook substitute. Son adores sweet little Gerald who being a dwarf hamster, will never grow to be tall, though he may grow fat. He has treasure troves of nuts and delux hamster food hidden by Son all around his cage. As we speak, Son is teaching Gerald how to play video games and I will leave them to it. Good bye now. I must leave at 7.30am tomorrow and on Saturday and I need a bubble bath to make it all worthwhile. Settle yourselves, pour the tea, put the kids (lovingly) outside, tell the boss you will do it later, and let us discover what this week has all been about. I was attuned last weekend, and am now Reiki 2. This means that I can do it all over the place; people, rooms and buildings either by being there or by distance; I can heal plants, animals, people, things. This is the idea, and I expect all of you who have been doing Reiki 2 for years are sighing gently and thinking, I was like that once. Here I am though, on a high, power mad and healing all the rooms in my house and then, the garden and then - other people's gardens. I sent healing to Felicity Warner's orchard in my enthusiasm imagining all her apple trees filling up with Pink Lady apples (my favourites, and not in Felicity's orchard. Yet.) and imagining Tesco sending lorries to pick them up and sell them in their stores. I have sent distance healing to kind and willing friends, none of whom have been cured, but I tell myself, they may have felt a bit better at some point. In order to be able to practice as a business, I still have to do my Anatomy and Physiology for the required insurance so that when you shoot into orbit after a healing session and lose your contact lenses, we can replace them on the insurance. Reiki is a lovely form of healing through energy. When I am doing it, I am only a channel for God's love and energy, and it isn't me at all. Despite being addicted to praise I have to concede that it is God, and that the recipient receives the healing they want and choose to receive, through me channeling God's love. Probably a good thing, without the correct distance and understanding I could say Look! Look what I, mighty Reiki Mama have done! No one helped me, I just healed you fair and square and any divine stuff is because I can! Bow low, and send me your friends to be healed too. So I have now only my lavender bushes in the front garden left to Reiki. The entire house and contents have been done, all the flowers in the porch, and the entire garden too. The lavender however, is resisting and is turning into dried out old gorse bushes and so needs a gentle, extra concentrated but fairly stern session. Oh this is what we do, we who tend to love cake and fried eggs on toast. We become porky, and find ourselves needing some help to shed it again. I have been eating so much lovely stuff recently and was shocked to find that my clothes no longer fit me. Of course I went into denial - they were shrunk in the wash, it was the their fault, and not mine. Going out to eat is such a joy, but I was beginning to select my pudding before my other courses (courses, mind, not course). Bit by bit I expanded until the day, recently, when I put on a lovely (elasticated) sun dress to go for a walk with my 82 year old mother, who is known as OGL, Our Great Leader. My, said my mother, what do you consider is your downfall with food dear? How is your diet going? Goodness me! I replied, I am not on a diet! and then, I don't want to talk about it. That I don't want to talk about it, made me realise that I was avoiding the issue. I had put on weight and there was no two ways about it. So I toddled off to Weight Watchers, Bognor Regis, to find that I have 2 stone to lose. Day two today, and I am doing well. I have bought a scales and am measuring proper portions and am feeling, funnily enough, fine. I aim to be back to normal by Christmas in order to join again in January. When I get back to wearing all my clothes that I once took for granted would fit me forever, I shall celebrate by going out for dinner with my dear other half Alan, and have two puddings for starters, and two more after the main course. I am going to take AGD (the A Graceful Death exhibition - see www.agracefuldeath.blogspot.co.uk) to Edinburgh on the 14 November. I am showing it, with a small amount of talking, in the annual event of the Scottish equivalent of Dying Matters, Good Life, Good Death, Good Grief http://www.goodlifedeathgrief.org.uk/. I am very excited about this, it is being held in Edinburgh Zoo. The last single day showing of the exhibition was at Notts County Football Ground, and that went very well. I won't be showing it next to the Orang Utangs, it will be in a nice big lecture hall in the main building. It will take four days to drive there, set up, do the exhibition and presentations, and drive back again. Bognor Regis to Edinburgh and back with 48 paintings, books, telly to show the film is going to be so exciting for a thin, healing artist. I shall post more on this later, as it is still in its organising stage. I find myself becoming transported by Lizzie's music. I think it is beautiful. She composed, played, recorded all of this herself and I am in such a state of happiness that Lizzie has agreed to let me use it. And, when we have opening nights of the exhibition, Lizzie will play a concert of her music live. I can't think of anything more lovely. Somehow, even though AGD is not just about Steve any more, I can feel Steve loving this music. It brings him back to me, and if I could be ridiculous for a moment, I feel him with me in it. I stopped off on the way home from St Ives to have lunch with Lizzie, and took a quick photo of her garden. Even this photo matches her music. And of course, we had a lovely lunch and talk too. I want to play this music for AGD because it is beautiful, and it doesn't lead me anywhere. I am not suddenly sad on hearing it, nor am I suddenly happy. I am affected by it just because it is lovely but it doesn't interfere with the exhibition, the paintings and the poems. It stands both alone, and it complements the exhibition. 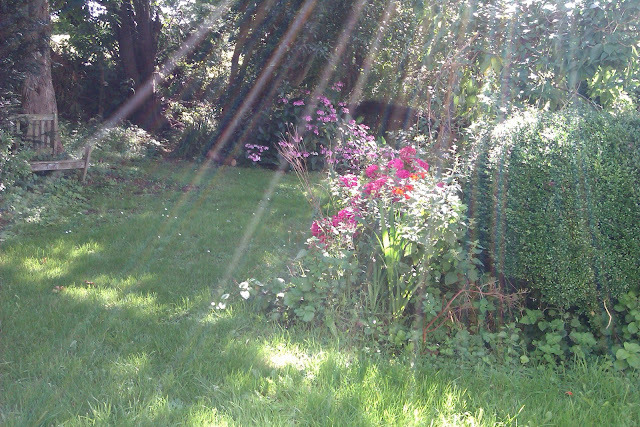 Look at the rays of light in the photo below. Wouldn't you think someone for whom this is a part of their house, would write music as lovely as she does? Lizzie Hornby's garden, just perfect for both Lizzie herself and her music. I am trying to love Green Tea. It is, I am told, good for weight loss. This is hard work but I know people who have not only persevered with, but like the stuff. And none of them are fat. It is my fate to drink green tea to be beautiful again. Tomorrow, I meet my 82 year old mother on a train going to London. I get on at Bognor and she catches it as it flies through Pulborough. We are, she tells me, going to hit the hotspots. I believe her. I shall wear corsets. I have started my volunteering with Age Concern UK. As a volunteer, I am on the Good Neighbour scheme where I visit an elderly person who is lonely once a week for 12 weeks, in order to have tea and chats. I love this, and the person who I am visiting has had a truly amazing life. I found myself terrified for any nice Age Concern UK volunteer who was given my mother to befriend, should the need arise. They would not last five minutes. I have decided to write a book. When, is anyone's guess, but the decision has been made. And finally, a friend has just texted to say that the Reiki worked, she is feeling happy again. Darling friend, I didn't do any. So I will just take the credit and move on quickly.